So: $267 billion of your money is being put at risk on a complex long-dated debt operation of dubious benefit, while the leader of that operation comments that much more money might be needed down the road. That’s news item one. News item two: Moody’s announced a mass downgrade of American and European banks. Goldman Sachs and Morgan Stanley took a hit. So did Bank of America, JP Morgan and Citigroup. So too did a raft of European banks, including some of the biggest. The markets didn’t react much to these downgrades, but only because the credit failings of these banks has long been baked into the price. Credit default swaps on two nationalized British banks, RBS and Lloyds, are already priced at junk levels. Anything Moody’s says now is like a punch line delivered long after the party guests have departed. In reality, the truth is probably worse even than Moody’s is suggesting. Many of these banks will see further downgrades, some of them sharp, before this crisis is done. Now these things are connected. They’re connected in the simplest of ways. The central banks are committed to a policy of debasing the currency, manipulating interest rates and artificially inflating asset bubbles. Meantime, the Western financial system is in parlous shape. Well, duh! Of course. You don’t fix lousy banks by printing wild sums of money to prop up the markets. You fix lousy banks by writing off bad loans, forcing shareholders and creditors to take the hit. You clean up and move on. It’s so obvious a child could see it. But not Ben Bernanke. Part of the problem is a kind of academic groupthink. Two of the world’s leading central bankers are Ben Bernanke of the Fed and Mervyn King of the Bank of England. King was a visiting professor at Harvard and then MIT, where he shared an office with the then Assistant Professor Ben Bernanke. They come from the same intellectual hutch, the same narrow world-view. And please note, that world view is born of academic theory, not practical reality. It’s born of an obsession with the Great Depression in the 1930s … forgetting that everything, but everything, has changed since then. Back then, trade was limited, international finance modest, government finances strong, consumer credit exceptionally low, derivative markets all but non-existent. Not one of those things is true today. Government finances are shot to hell. Derivatives markets have bcome too big to regulate and too vast to fail. Consumer credit is terrifying. And the whole world is connected in one lethal stew of poor credit, mistrust and non-disclosure of losses. So let’s keep this simple. I argue the Great Depression has almost nothing to teach us. The academic central bankers who have guided us into this crisis, and have been printing money throughout it, are only making the problem worse. The mess our banks are in is in large part due to the failures of these same central bankers, the like-minded Nobel laureates and the same old recycled economic advisors. The recipe for recovery is simple too. You need to rip the bandages off. It’ll hurt, but the patient will get better. Banks (and central bankers) need to face up to their losses. If shareholders and bondholders have lost money, then tough. Why on earth should taxpayers pick up this tab? Because the banks have hired expensive lobbyists to purchase politicians’ favor? I don’t think so. We are currently in the midst of a major depression. Unemployment (measured by U-6) is at almost 15%. The economic projections in the White House’s budget are clearly powered by the kind of substances that President Clinton once smoked (but did not inhale). The government deficit is in meltdown, yet hasn’t remotely engineered the kind of growth-led recovery we had been led to expect. I’m not surprised. Here on Planet Ponzi we hold these truths to be self-evident. That the Fed is becoming impotent; it’s running out of bullets. The Fed is out of touch with reality, printing trillions of dollars without the consent of the people of America. That the Fed is taking on a giagantic risk position in long-dated securities, which will have catastrophic consequences if — or rather when — interest rates rise. That existing policies have clearly, plainly and unequivocally failed — yet are still being implemented seemingly without end. It’s time for a change, and the change can’t come too soon. I could not agree more. Greenspan was no better. Fire them all! I am sure you realize this but…since 2001 the Federal Funds rate has been held artificially low from “0” to 1.75% for 9 1/2 YEARS! It has only been “normal” for 18 months at the end of which the US had a near economic collapse. 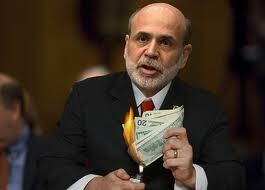 Ben Bernanke should face criminal charges if only there were laws to charge him.